The European Commission’s Directorate-General for International Cooperation and Development (DG DEVCO) is responsible for designing and implementing EU international cooperation and development policy which, among others, commits the EU to “promote a ‘green economy’ that generates growth, create jobs and helps reduce poverty”. DG DEVCO works closely with other Commission services responsible for thematic policies, as well as with the European External Action Service (EEAS) and Commission services on external action. The EEAS is responsible for running 139 EU Delegations and Offices operating around the world, representing the European Union and its citizens globally. The EU Delegations play a key role in presenting, explaining and implementing EU’s foreign policies. The United Nations Environment Programme (UNEP) plays a prominent role in promoting the transition to a green economy, by serving the Ten-year Framework Programme (10YFP) Secretariat on the one hand, and by being involved in the implementation of the SWITCH regional programmes on the other. . The UN Partnership for Action on Green Economy (PAGE) brings together five UN agencies – UNEP (United Nations Environment Programme) UNDP (United Nations Development Programme), UNIDO (United Nations Industrial Development Organization), ILO (International Labour Organization), UNITAR (United Nations Institute for Training and Research) – to provide assistance to interested countries in developing, adopting and implementing green economy policies and strategies, as well as assisting countries in achieving and monitoring the Sustainable Development Goals. The green economy transformation is at least as important for developing countries as it is for developed economies. Developing countries face the same necessity to improve the environmental sustainability of their economy and mitigate the economic costs of further environment degradation, which, if unaddressed, could lock them further into poverty. At the same time, more efficient resource use, and presence on the rapidly growing global environmental goods and services market are important for developing countries’ competitiveness and growth. 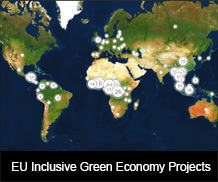 The SWITCH to green initiatives covers Africa, Asia, Latin America, and EU neighbouring countries. As underlined in the 2014 Communication from the Commission on the role of the private sector in international development, the private sector is expected to play a key role in driving the transformation to the green economy. Adopting environment-friendly business practices is already widespread, with many commercial and economic opportunities making such a process attractive to the private sector. The private sector acknowledges the rapid growth of the environmental goods and services global market, the prospects for savings from resource efficient production processes, for improved reputation, and increased security of supply chains resulting from the procurement of sustainably produced raw materials. It is therefore responding positively to this challenge, with relevant initiatives being important drivers of green economy transformation in many countries. Europe 2020 strategy: EU’s growth strategy aiming at facilitating a more competitive economy with higher employment by delivering growth that is: smart, with effective investments in education, research and innovation; sustainable, following the path to a low‑carbon economy; and inclusive, fostering job creation and poverty reduction. EU Roadmap to a Resource Efficient Europe: It sets objectives for 2020 and indicates action to be taken in SCP, waste, research and innovation, environmentally harmful subsidies, ecosystem services, biodiversity, minerals and metals, water, air, land and soil, marine resources, food and drink, buildings, and mobility. EU Roadmap to a Low-Carbon Economy: It sets incremental targets until 2050 on greenhouse gas emissions, along a cost‑effective pathway to a Competitive Low‑Carbon Economy, indicating how the main sectors responsible for Europe’s emissions — power generation, industry, transport, buildings and construction, and agriculture — can help make the transition successful. The 7th Environment Action Programme: Living well, within the limits of our planet: It aims at enhancing Europe’s ecological resilience and transforming the EU into an inclusive green economy, recognising three thematic priority objectives (natural capital protection; EU shift to a resource‑efficient, green and competitive low‑carbon economy; EU citizens health and well-being) and six objectives establishing an enabling framework supporting effective action (improved implementation of legislation; EU environment policy based on increased knowledge; environment and climate policy investments secured and environmental externalities accounted for; improved environmental integration and policy coherence; EU sustainable cities; effectiveness in addressing international environmental and climate‑related challenges). EU Energy Roadmap 2050: It sets out a strategy for the energy system to balance between greenhouse reduction targets on the one hand, and on the other, the need to increase competitiveness and security of supply, building possible scenarios for 2050. It focuses on four key aspects: energy efficiency, renewable energy, nuclear energy and carbon capture and storage. EU Roadmap to a Single European Transport Area — Towards a competitive and resource efficient transport system (White Paper): It aims at breaking the EU transport system’s dependence on oil without sacrificing its efficiency and compromising mobility, through the use of less and cleaner energy, the exploitation of modern infrastructure and the reduction of negative impact on the environment and key natural assets like water, land and ecosystems. Circular Economy Strategy (Closing the loop – An EU action plan for the Circular Economy): The Circular Economy Package has been adopted with a view to boosting global competitiveness, fostering sustainable economic growth and generating new jobs. It consists of an EU Action Plan for the Circular Economy, with measures covering the full life cycle of products: from production and consumption to waste management and the market for secondary raw materials.